31°C, no cloud and light NW wind. I rode Focus hire bike with MapMyRide+! Distance: 27.03km, time: 01:35:10, pace: 3:31min/km, speed: 17.04km/h. This photo was taken on the first of two rides on this day. Even though it was hot, I was desperate to try out the new hire-bike. It comes with a light frame and Ultegra groupset. The gearshift is silky-smooth and has ideal gear ratios for this terrain. Here in Mallorca, there are long long climbs of up to 1:12. Later, I rode west into the mountains towards Col De Femenia. I turned back not long before the col because of time. The ride back would only be 40 minutes long and this is when the bike really showed what it could do. The stiff frame was very accurate on corners and banking over was confident. The only negative I could think of was the wheel-set. A pair of Mavic Aksuim might have been better. 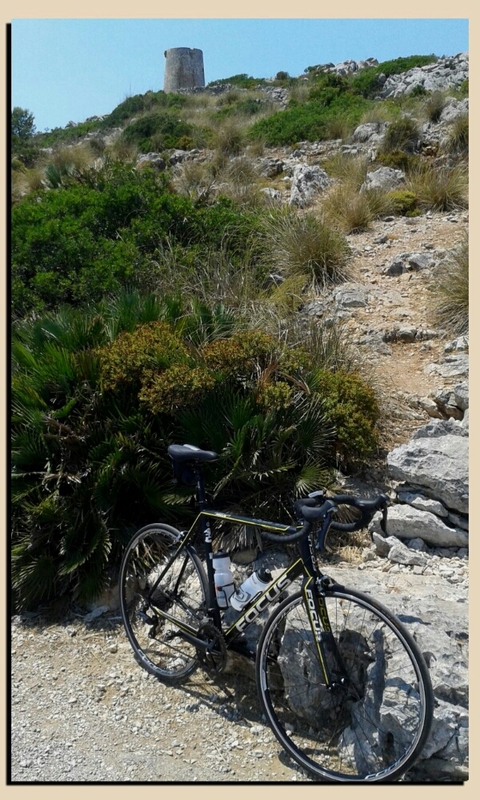 This entry was posted in No category and tagged Focus road bike, mallorca. Bookmark the permalink.